Before the Winter break, Mr. Jordan Marr’s psychology class at Exeter-Milligan studied about the various senses humans experience. For this lesson, the students learned about their sense of taste. 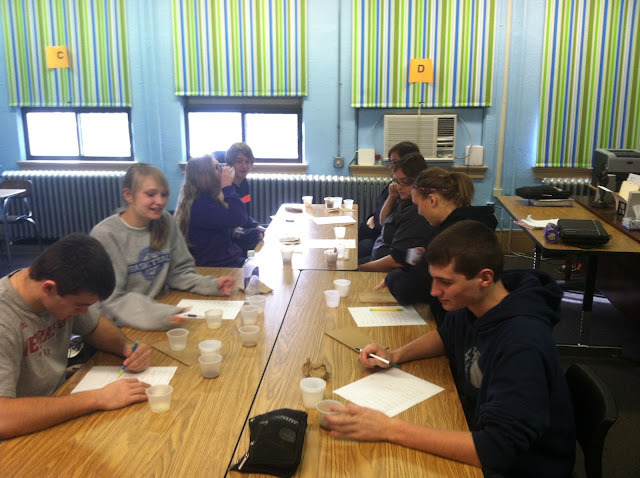 In the picture, students are taste testing various foods to decide if the item is mostly bitter, sweet, sour, or salty. The students continued their study of the senses by participating in a smell lab the next day. Pictured are L-R: Robbie Androyna, Jackie Luzum, Madeleine Ensrud, Jesper Anker, Ashley Miller, Meghan Miller, Megan Waldron and Jacob Kroll.